Get 3 for the price of 1 with a fully equipped drop leg platform that includes a fully lined MOLLE paneled thigh rig, a universal MOLLE pistol holster with integrated magazine pouch, a MOLLE utility pouch with quick-release buckle and a open top utility pouch with a quick-release retention strap. Keep your most crucial gear right at your finger tips so you may equip them at a moment's notice when you need them. As the name suggests the rig drops down onto your leg where your hands naturally would be in an idle stance. The thigh rig is worn through a loop that attaches onto one's belt and is secured to your leg via two quick-release straps that can be adjustable to fit a multitude of users. The entire face is lined with MOLLE web panelings to accept an assortment of MOLLE gear and attachments. Being fully equipped it comes with a universal holster that can fit a variety of common pistols including 1911's, M9's, USP's, revolvers and many more! Built into the holster is a integrated pouch to store a spare magazine with making reloads easier by making the magazine as accessible as the pistol. 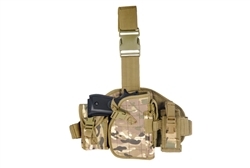 Two additional utility pouches are included and can be attached to the thigh rig at your own desecration for a completely customized load out. Includes a traditional pouch with a flap enclosure to keep your smaller items from getting lost as you move about. Or for slightly larger items an open top pouch is included and can easily accommodate items such as a radio where the antennae would have trouble in a fully enclosed pouch. Still designed to keep a hold of your items, the open-top pouch features a simple retention strap that won't get in the way while keeping whatever you're carrying safe and secure from falling out. Made out of durable 600 denier Multi-Camo patterned polyester materials.